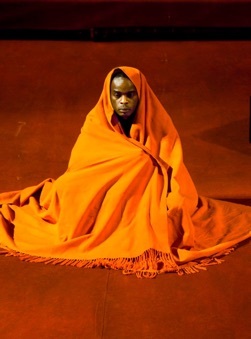 With his latest work Battlefield Peter Brook at 90 years old has created one of his most beautiful theatre pieces yet. The play has a reflective, valedictory quality that stems in part from its subject matter and in part from its place in the director’s oeuvre. In the 1970s Brook and Jean-Claude Carrière adapted the enormous 200,000-line Sanskrit epic poem Mahabharata into a nine-hour-long stage play first performed in 1985. The play was one of Brook’s greatest triumphs. Now Brook and Marie-Hélène Estienne, who helped create a screenplay of The Mahabharata, return to the epic again to create the 70-minute-long Battlefield that feels like an epilogue to the earlier stage work. battlefield soaked in the blood of so many heroes and littered with their corpses, and wonders how he can morally accede to a throne that has been won with so much death. Acceptance of death and acceptance of duty become the twin themes that animate the play. Early on Yudhishthira learns the great irony from his mother Kunti (Carole Karemera) that Karna, his arch-rival in his battle with the Kauravas, was in fact his own brother. Kunti sends Yudhishthira out to reconcile himself with Karna (Ery Nzaramba) before he dies. Yudhishthira learns that the goddess Dharma had entered Karna’s body to protect him until the god Krishna ordered her out. Kunti also tells Yudhishthira to seek out his grandfather Bhishma (Ery Nzaramba). Bhishma tells Yudhishthira three parables. The first is about a snake who has bitten a boy and caused his death. The second is about a falcon and a pigeon. The third is about a worm. In the first a man wants to kill a snake for having killed his son. The snake, however, says that he may have been the instrument of death but was not the cause of death. Death itself was the cause. Then Death (Carole Karemera) appears and says that she is not responsible for the death but the law that governs her, Time. Time (Carole Karemera) then appears and says that she is not responsible but rather Destiny. Therefore, does the man’s killing the snake for killing his son in fact exact revenge on the reason for the son’s death? Through Bhishma’s parables, Brook and Estienne explore the nature of death and destiny. In the second parable, a king (Ery Nzaramba) has a beloved pigeon (Carole Karemera) and wants to keep it safe from a falcon (Sean O’Callaghan). The king offers to give the falcon as much of his own flesh as will equal that of the pigeon, but he finds that even his entire body will not equal the small bird’s weight. The reason is that the gods have tested him to see the strength of his love for the bird. In the third, a worm (Sean O’Callaghan) is crossing a path known to be used by chariots. A man questions the creature to find out the humorous truth that the lowly thing, once a rich man reincarnated into this form, wants to live its life to the fullest. The most moving event of the play occurs when Kunti and Dhritarashtra tell Yudhishthira that the time has come for them to give up all their worldly goods and to go live in the forest. They go, as do many pious Hindus, not just to give up worldly goods but to give up the world. When a forest fire rages, the two decide calmly to walk directly into it. The empty thrust stage of the Young Vic is covered with a floorcloth of a dark orange colour, rather as if it were sand that had been soaked with blood. The only props are a few bamboo sticks, a larger walking stick that Dhritarashtra uses and the characters’ shawls and scarves. People still associate the name Peter Brook with such spectacular shows as Marat/Sade from 1964 and A Midsummer Night’s Dream on trapezes from 1970, but they forget that since at least La Tragédie de Carmen of 1981, where Brook got rid of the chorus of the opera and all the extraneous characters, the director has been pursuing an ever more minimalist directorial style, one seen recently in Toronto in 2007 in Sizwe Bansi est mort. says that it is time for him to die. To signify the soul departing the flesh, Jared McNeill simply raises the shawl that Ery Nzaramba is wearing as Bhishma until it covers Nzaramba’s face and head. When a story with such universal themes can be told with such exquisite simplicity and with such profound impact, it makes all the tech-heavy stagecraft one sees look foolish. Other than the highly detailed acting of the cast and the few significant props, all Brook uses for effect is Philippe Vialatte’s amazingly sensitive lighting and the live music of Toshi Tsuchitori played on a tsuzumi, the hourglass-style Japanese drum used to accompany Noh plays. What Brook and Estienne do in Battlefield is not merely to look back to The Mahabharata but look back to the origins of drama itself in storytelling. This explains why Battlefield contains so many stories within its main story and why stories are used to help Yudhishthira steel himself to fulfil his destiny by becoming king after such devastation. Brook and Estienne show us how easily the narrator of a story becomes an actor to make the characters of the story come alive. Just as Yudhishthira must start his kingdom anew from nothing yet knowing another war will take place, so Brook and Estienne show us how drama begins again from nothing. The last story in the play concerns a boy sitting under a tree. Who the boy is is whispered to an actor. Tsuchitori plays the actor’s reaction to the name, a virtuoso riff of drumming that moves from full hands on the drumhead to fingers on the rim trailing off to nothing. The silence that follows is astonishing. It feels like a revelation. 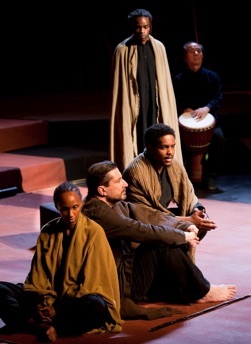 Photos: (from top) Sean O'Callaghan, Jared McNeill, Ery Nzaramba, Carole Karemera and Toshi Tsuchitori; Carole Karemera, Sean O'Callaghan, Jared McNeill, Ery Nzaramba and Toshi Tsuchitori; Ery Nzaramba as Bhishma . ©2016 Simon Anand.